We’ve featured a great many unique clocks here on Hackaday, which have utilized nearly every imaginable way of conveying the current time. But of all these marvelous timepieces, the Morse code clock has the distinct honor of simultaneously being the easiest to construct and (arguably) the most difficult to read. As such, it’s little surprise we don’t see them very often. Which makes this latest entry into the field all the more interesting. [WhisleyTangoHotel] has taken the basic concept of the Morse clock, which at its most simplistic could be done with a microcontroller and single LED, and expanded it into a (relatively) practical device. With both audio and visual signaling, and support for pulling the time from NTP, this is easily the most polished Morse code clock we’ve ever seen. Using it still requires you to have a decent grasp on Samuel Morse’s now nearly 200 year old encoding scheme of course, but on the bright side, this clock is sure to help keep your CW skills sharp. For those following along at home, [WhisleyTangoHotel] provides a hand-drawn diagram to show how everything connects together in his Morse timepiece, but there’s nothing on the hardware side that’s likely to surprise the Hackaday reader. A single momentary push button represents the device’s sole user input, with the output being handled by a LED “tower” and speaker on their own respective pins on the microcontroller. 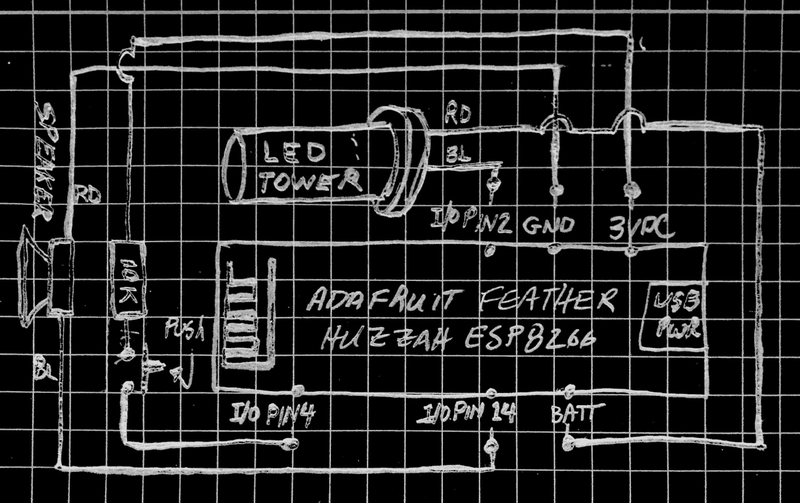 Here a Adafruit Feather HUZZAH is used, but any ESP8266 would work in its place. Of course, the advantage of using an ESP8266 board over your garden variety MCU is the Wi-Fi connectivity. This allows the clock to connect to an NTP server and get the current time before relaying it to the user. Some might think this overkill, but it’s really a critical feature; the lack of a proper RTC on the ESP means the clock would drift badly if not regularly synchronized. Assuming you’ve got a reliable Internet connection, this saves you the added cost and complexity of adding an external RTC. [WhisleyTangoHotel] wraps up his blog post by providing his ESP8266 Arduino source code, which offers an interesting example in working not only with NTP and time zones on the ESP, but how to handle parsing strings and representing their principle characters in Morse code. Interestingly enough, in the past we’ve seen a single LED clock that didn’t use Morse code to blink out the time, which might be a viable option as an alternate firmware for this device if you’re not in the Samuel Morse fan club. In 2010, [Jose Espejo] was close to retirement from the Colombian army. But he was bothered by the fact that some of his comrades were hostages of FARC (the Revolutionary Armed Forces of Colombia; the anti-government guerrillas), some for as many as ten years. There was a massive effort to free hostages underway, and they wanted them to know both to boost morale and so they’d be ready to escape. But how do you send a message to people in captivity without alerting their captors? It wasn’t long ago that you needed to know Morse code to be a ham radio operator. That requirement has gone in most places, but code is still useful and many hams use it, especially hams that like to hack. Now, hams are using the Raspberry Pi to receive highly readable Morse code using very low power. The software is QrssPiG and it can process audio or use a cheap SDR dongle. There are a few reasons code performs better than voice and many other modes. First, building transmitters for Morse is very simple. In addition, Morse code is highly readable, even under poor conditions. This is partly because it is extremely narrow bandwidth and partly because your brain is an amazing signal processor. Like most communication methods, the slower you go the easier it is to get a signal through. In ham radio parlance, QRS means “send slower”, so QRSS has come to mean mean “send very slowly”. So hams are using very slow code, and listening for it using computerized methods. Because the data rate is so slow, the computer has time to do extreme methods to recover the signal — essentially, it can employ an extremely narrow filter. Having a QRSS signal detected around the world from a transmitter running much less than a watt is quite common. You can see a video introduction to the mode from [K6BFA] and [KI4WKZ], below. Morse code enthusiasts can be picky about their paddles. After all, they are the interface between the man and the machine, and experienced telegraphers can recognize each other by their “hands”. So even though [Edgar] started out on a cheap, clicky paddle, it wouldn’t be long before he made a better one of his own. And in the process, he also made what we think is probably the thinnest paddle out there, being a single sheet of FR4 PCB material and a button cell battery. This would be perfect for a pocketable QRP (low-power) rig. Check it out in action in the video below. There’s not much to a Morse code paddle. It could, of course, be as simple as two switches — one for “dit” and one for “dah”. You could make one out of a paperclip. [Edgar]’s version replaces the switches with capacitive sensing, done by the ATtiny4 on board. Because this was an entry in the 1kB challenge, he prioritized code size over features, and got it down to a ridiculous 126 bytes! Even so, it has deluxe features like autorepeat. We’d have to dig into the code to see if it’s iambic. We’ve featured quite a few of [mitxela]’s projects here in the past, and many of them have the propensity to be labelled “smallest”. His Morse Code USB Keyboard Mk II adds to that list. It’s a Saturday afternoon project, with a few parts slapped onto a piece of perf-board, that allows using a Morse key as a USB keyboard. This project isn’t new or fresh, but we stumbled across it while trying to figure out a use for a Morse key lying in the author’s bin of parts. You can practise transmitting, by reading text and typing it out on the key, and then look it up on your computer to see if you made any mistakes. Or you can practise receiving, by asking a friend to punch it out for you. Either way, it’s a great way to hone your skills and prepare for your radio operators license exam. The project is a follow up to his earlier one where he hooked up the Morse key via a RS-232 — USB converter directly to a computer and let the code do all the work. That turned out to be a very resource hungry, impractical project and made him do it right the next time around. The hardware is dead simple. An ATtiny85, a piezo buzzer, some decoupling capacitors, and a few resistors and zeners to allow a safe USB interface. The design accommodates a straight key, but there is one spare pin left over in the ATtiny to allow for iambic or sideswiper keys too. There is no speed adjustment, which is hardcoded at the moment. That isn’t very user friendly, and [mitxela] suggests adding a speed potentiometer to that last remaining pin on the ATtiny. This would prevent use of iambic/sideswiper keys. Or, you could use the RST pin on the ATtiny as a (weak) IO. The RST pin can read analog values between 5V and 2.5V, and will reset when voltage falls below 2.2V. Or just use another microcontroller as a last resort. For the USB interface, [mitxela] is using the V-USB library after wasting some time trying to reinvent the wheel. And since this is designed to work as a HID, there are no drivers required – plug it in, and the OS detects it as a keyboard. He’s borrowed code from the EasyLogger project to use the internal oscillator and help free up the IO pins. And to detect the characters being typed, his code uses a long string of compare statements instead of a dictionary lookup. Writing that code was tedious, but it makes the identification quicker, since most characters can be identified in less that five comparisons (one dit = E, two dits = I, three dits = S and so on). This “tree” makes it easier to figure it out. If you’d like to look up some of his other “tiny” projects, check out The smallest MIDI synthesizer, Smallest MIDI synth, again! and the ATtiny MIDI plug synth.